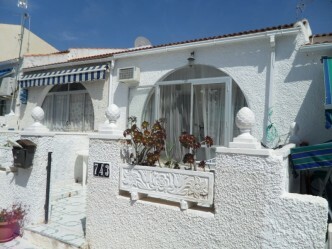 `Pepita` style bungalow situated in La Siesta. With bars, restaurants, banks and supermarkets only a short walk away and the natural parkland of Laguna de La Mata at the end of the calle, everything that is needed for your new life in the Spanish sunshine is here. It offers a glazed porch, currently used as a dining room, large lounge, American style kitchen, double bedroom, galleria, and bathroom. The lounge looks out onto a fully tiled terrace which makes an attractive al fresco dining area. The galleria off of the master bedroom could make an attractive en-suite bathroom. This property is priced to sell quickly, so early viewing is recommended. We have many more bargains..please see our wesite.